In 1990, Kiko Lopez, having left life as an architect in New York, packed up and shipped out for a life in the south of France, settling down in the countryside with his wife and establishing his own architectural office and design atelier in Les Beaumettes. Since, he’s made his life’s work the unique application of antique mirroring techniques, like the rare craft of pâte de verre and the creation of one-of-a-kind tableaux in silver and glass, distinguishing himself as one of the foremost artists and craftsmen working in this field. He is now one of the only artisans responsible for keeping these traditional decorative techniques alive. What’s more, he’s breathed new life into these techniques, re-imagining them anew. Over the course of the thirty years since, he has completed major commissions on behalf of Cristalerie St. Louis, Le Musée de l'Homme, and Les Quatres Temps of La Défense, as well as for Alberto Pinto, Chahan Minassian, and Caroline Sarkozy. In the slideshow below you will find one of his recent projects commissioned by gallery Gatserelia, Bierut—conceived for an entrance to a sky high midtown apartment. Both Puerto Rico and Florida, where Lopez was raised, gave the artist a keen sensitivity to the play of light. His subsequent years in France have only deepened this appreciation and the element’s critical influence on his work. This is no more evident than in the luxurious entryway pictured below. 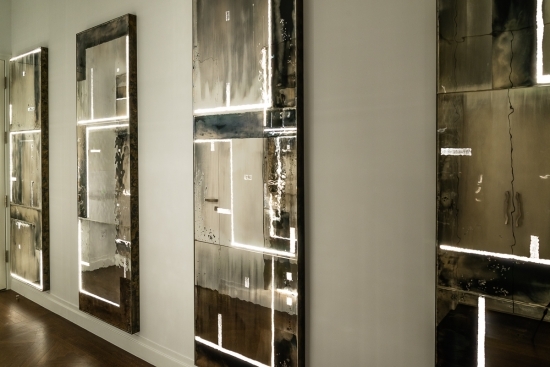 The sequence of rectangular mirrors don’t merely reflect the light from the grand windows beyond (bright and clear by day, beautiful and surreal, beaming up from below by night)—they are also illuminated by a marvelously abstract arrangement of strips from behind, guiding the visitor’s entry into the apartment beyond.